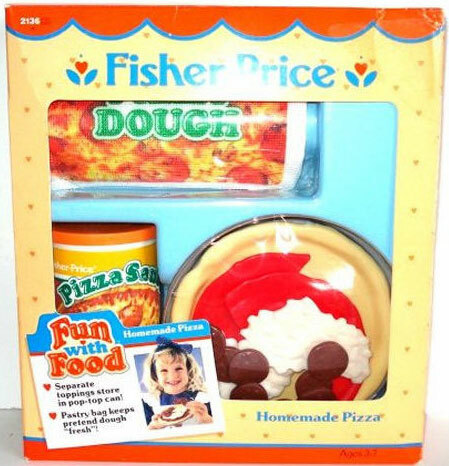 Description: The Homemade Pizza set is the first Fun With Food pretend pizza set ever made by Fisher-Price. 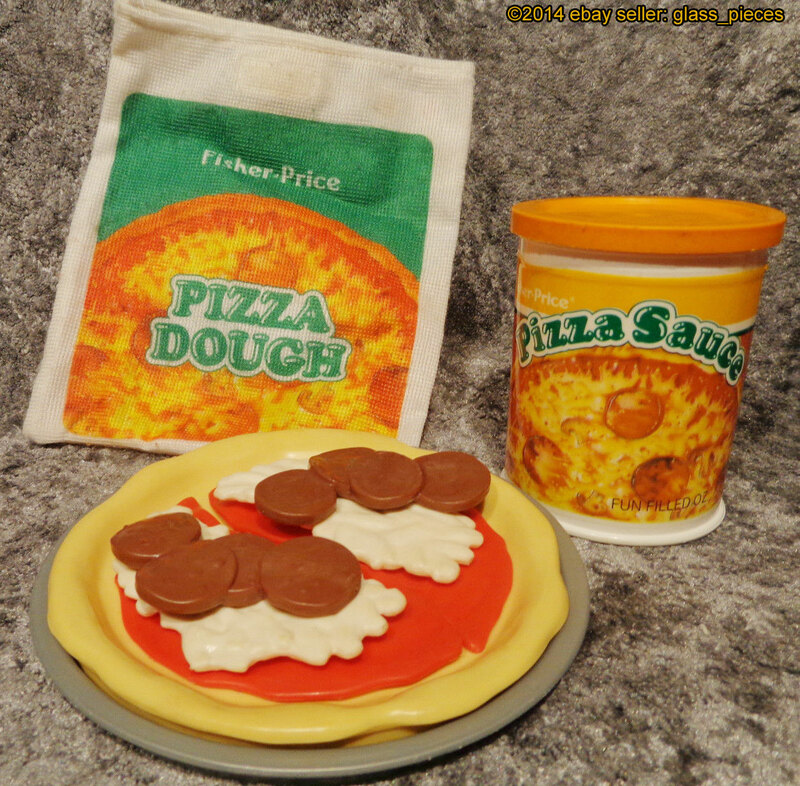 The set includes realistic pizza dough that fits inside a pastry bag to "keep it fresh". The set also includes pizza sauce, cheese and pepperoni toppings that fit inside a pizza sauce container. Children can prepare the pizza and serve it on a "personal" size pizza pan. Designed for children ages 3 to 7 years old. FPT7242 - Round white plastic sauce can with a paper litho wrapped around the side. The litho has a picture of a cheese a pepperoni pizza on the front with the words "Pizza Sauce" above it in green and white. The top of the litho has a yellowish-orange ring with the words "Fisher-Price" in white. FPT7382 - Round white plastic lid that fits onto the pizza sauce can mentioned above. This lid fits onto any of the round Fisher-Price cans. *See "Variations" below. FPT7244 - White cloth pastry bag with print on the front. The front print has a green top half with "Fisher-Price" in white. The bottom half of the print has a cheese and pepperoni pizza and the words "Pizza Dough" in green and white in the middle of the pizza. The FPT7246 pizza dough fits inside the pasty bag. FPT7245 - Round cream-colored molded plastic pizza dough that is spread out to the side of a personal-size pizza with slightly raised edges. This dough fits into the FPT7245 pizza pan and into the FPT7244 pastry bag. 2 each - FPT7247 - Red half-circle molded plastic pizza sauce. This pizza sauce is flat and molded to look like spread sauce on a pizza. 2 each - FPT7248 - White molded shredded cheese mound (Swiss Cheese). The mold is flat with long rectangular shredded cheese pieces molded together. 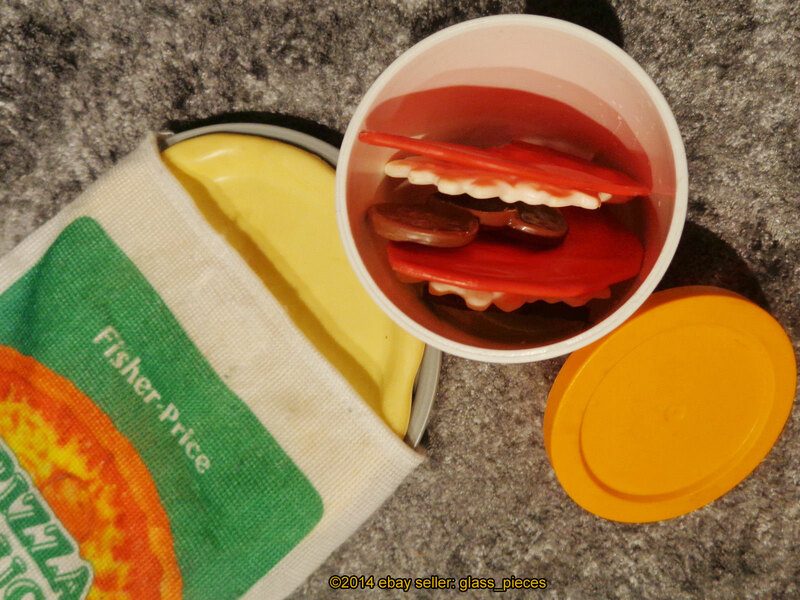 2 each - FPT7249 - Red plastic pepperoni mound. Each mound has 4 slices of pepperoni molded together. FPT7246 - Round silver plastic personal-size pizza pan/plate. The edges of the pan are slightly raised. Measures 5-7/16" diameter. FPT7250 - Sold in a 8-7/8" long, 9-7/8" high, 2-7/8"deep display box. 1990 - Also sold in #2145 Play Food Assortment.